COUSINS Donald Graham (Don) Passed away peacefully on Saturday, June 8th, 2013. Head of English and Deputy Head of the former Canon Frome Secondary School, Herefordshire. Popular local athlete and one of the founder members of Hereford and County Athletic Club who who has died after a long illness. Cousins was a key figure in county athletics, as a competitor and administrator, for more than 50 years. A founder member of Hereford and County Athletics Club, he served as treasurer, secretary, chairman and membership secretary. He was also a coach and stepped down from his final club role, as starter, in 2010. In fact, he was Herefordshire’s only qualified starter for nearly 50 years, controlling the necessary firearms for which he had a firearms certificate and safe in his house. Cousins ran in the first Herefordshire County Championshp in 1952, winning the 220 yards, the 440 yds and the long jump and continued to compete at county level into the 1960s. He formed the Hereford Athletic Club with other athletes in 1956 and this merged with Herbie Samuels’ Pontrilas AC in 1959, becoming the Hereford and County AC in 1962. He was the club’s first chairman with Samuels as secretary. From the early days, it was his dream to have an athletics track in the city and he pressed the local councils for years to see his hopes come to fruition. Finally, back in 1964, an area on Hereford Racecourse was allocated to the club for training purposes. “Don was not satisfied and proposed that we develop the facilities,” said long-time club colleague Tony Williams. 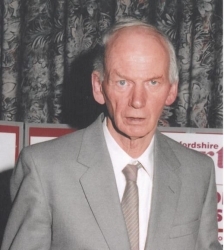 His contribution to the club and to athletics was recognised in 2002 when he was given Herefordshire Sport’s service to sport award, appropriately presented by Hereford United’s director of football Graham Turner as Don was a Bulls season-ticket holder who rarely missed a home match. In 2007, he was a nominee in BBC Sport’s Unsung Hero award. A former pupil at Hereford Cathedral School, Don Cousins entered St Paul’s Teacher Training College in Cheltenham after National Service in 1950. His first teaching post - at Hall Green Road Primary School in Birmingham - saw him join Birchfield Harriers for a period before returning to Herefordshire where he taught at Eardisley Primary School and then Lord Scudamore School. In 1962, he became head of the History and English Departments at Canon Frome Secondary School where he met his wife Mary. The couple married in 1972. He moved on to John Masefield High School as head of resources when Canon Frome school closed. The funeral service for Don Cousins, who leaves widow Mary, will be held at St Margaret’s church in Wellington on Monday at 2pm.